WiL supports Parliamentary Commission on Youth Violence. 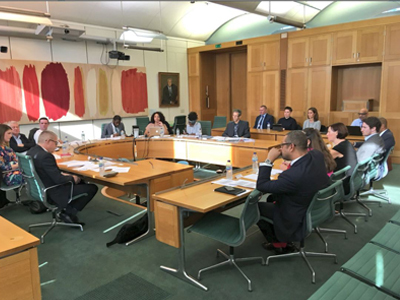 Warwick in London supports Parliamentary Commission on Youth Violence. Professor Abhinay Muthoo and Siobhan Benita, co-Directors of the Policy Lab, are overseeing Warwick’s input, which establishes Warwick as the lead academic partner to the Commission. The work includes development and delivery of the first ever national survey of young people (aged 11 to 24) on the levels of violence that they experience in their day-to-day lives. The survey was conducted in February this year and received around 2000 responses, including from young people in young offender institutes and pupil referral units. Initial results from the survey will be shared with MPs and Peers in late spring and will also inform a major event in London’s City Hall in May, which will engage young people from across the capital. The Commission is also conducting a series of evidence sessions in Parliament to gather testimony and insight from experts and young people directly affected by violence. These sessions are examining the way in which a range of issues - from childhood traumas, mental health, poverty and media influences – all impact on the types and levels of violence that many young people face today.